Larix pendula has luminous, lime green foliage in the spring. Over the summer the foliage deepens to green. In the fall the needles turn golden yellow before dropping to reveal the interesting tawny twigs. It is a lovely contrast to more horizontal evergreens and is especially suited to Asian themed gardens. 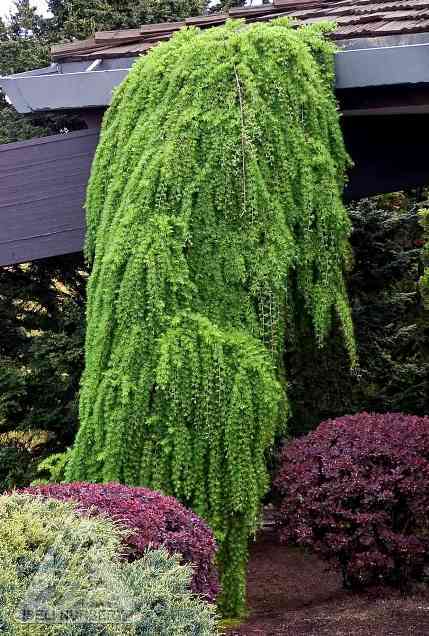 The conifer is best used as a single accent plant. Weeping Larch is quite adaptable to a range of soil types but does need constant moisture. It will require regular watering during the growing season unless it is growing in a very damp site. It is not drought tolerant and will drop needles if allowed to dry out. It looks its best if it is not pruned but allowed to develop its own unique form.